These hearty sandwiches come together in just minutes but deliver a big hit of flavor! Perfect for weeknight when you don't have a lot of time but want something out of the ordinary. Spread mayonnaise on each side of flat bread and top each half with a tablespoon of the tapenade. 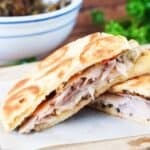 Layer turkey and a slice of provolone on each half and put together.